A hair transplant is a surgical intervention into baldness, which moves existing hair to a part of the scalp where hair is thinning or balding. 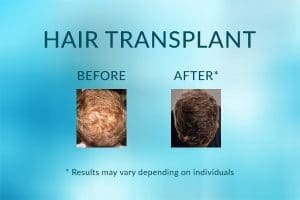 This treatment has been around for well over 50-years, but in recent years the technology and techniques behind hair transplants have improved significantly. Patients don’t have to deal with obvious and unsightly plugs; they now have real and natural looking hair transplant options at their disposal. There are several options available, and all are extremely effective methods of treating baldness in a natural-looking manner. The length of the procedure depends on the size of the treatment area. A numbing agent is also used on the scalp, so the procedure is entirely painless. Strand-by-Strand Surgical: Our Strand-by-Strand® is a follicular unit transplantation (FUE) that replaces each strand of hair one by one. This gives you a natural looking and permanent transplant that requires no maintenance because each strand will continue to grow naturally. Strand-by-Strand® Non Surgical: This method offers the same benefit as the surgical option, although it is a non-permanent approach. There is no scarring or surgery required, and our patients enjoy a 100% success rate. Female Strand-by-Strand® Non Surgical Hair Replacement: Hair loss afflicts women too. Our non surgical FUE hair transplant has been specifically designed to address female hair loss. Each strand is matched perfectly, so you can still create all your favourite hairstyles, and prevent the crippling self-doubt that hair loss brings. Advanced Singular Hair Grafting®: This method combines surgical and non-surgical techniques to restore hairlines instantly. Some hair transplant methods for the hairline take 6-months or more to look natural, our hair grafting technique seems natural right away. We can also complement these treatments with our other celebrated hair loss procedures, such as Advanced Laser Therapy and Thickening Fibres to give you a complete option for your hair loss. Why Opt for a Hair Transplant? As you can see from these hair transplant before and afters, the results are remarkable. Hair loss is about so much more than losing hair. So many patients report to us feeling as though they have been cheated out of their youth far too early, and that’s the problem with hair loss, it seems to be out of our control. With a hair transplant, you can take control of your before and after shot. Hair loss doesn’t have to alter the way you feel about yourself, or the way others perceive you. Stay young and stay in control with Advanced Hair Clinic’s hair transplant procedures.